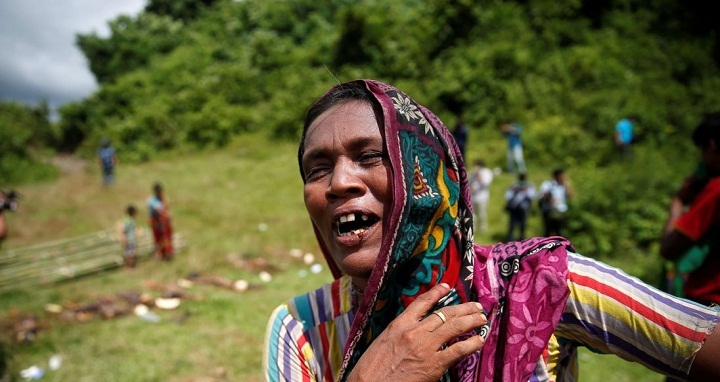 Dhaka, 23 May, Abnews: Rohingya militants massacred Hindu villagers during last year's uprising in Myanmar's Rakhine, Amnesty International said Wednesday in a report that sheds fresh light on the complex ethnic rivalries in the state. Myanmar's military responded to the insurgent raids with harsh reprisals that forced some 700,000 Rohingya Muslims out of the mainly Buddhist country where they have faced persecution for years. The UN says the army crackdown amounted to "ethnic cleansing" of the Rohingya, with soldiers and vigilante mobs accused of killing civilians and burning down villages. Those include the mass killing of Hindus in the far north of Rakhine, where the military took reporters -- including AFP -- to witness the exhumation of putrid bodies from a grave in September. But Amnesty International said Wednesday that a new investigation had confirmed the group killed 53 Hindus "execution-style" -- mostly children -- in the Kha Maung Seik village cluster in northern Maungdaw. "Our latest investigation on the ground sheds much-needed light on the largely under-reported human rights abuses by ARSA during northern Rakhine state's unspeakably dark recent history," said Tirana Hassan, crisis response director at Amnesty International. "Accountability for these atrocities is every bit as crucial as it is for the crimes against humanity carried out by Myanmar's security forces in northern Rakhine state," she added. Citing interviews with eight survivors, the rights group said dozens were rounded up, blindfolded and marched out of town by masked men and Rohingya villagers in plain clothes. "They slaughtered the men. We were told not to look at them... They had knives. They also had some spades and iron rods," 18-year-old Raj Kumari told Amnesty. While Rakhine was home mainly to Buddhists and Muslims before the crisis, it also boasts a small but longstanding Hindu minority -- many of whom were brought in by British colonisers looking for cheap labour -- as well as several other smaller ethnic groups. "It is important that the international pressure on Myanmar won't favour ARSA's actions," government spokesman Zaw Htay told AFP when asked about the Amnesty report.